I Fit That | Max Burrows | Car and Vehicle Kit Installations and Products | Hands Free, Bluetooth, Tracking and Parking Sensors. Life made easier: Just turn on the engine. Drive. Talk. It's that simple ! The Parrot CK3000 Evolution hands-free Car Kit offers the convenience of voice recognition and outstanding sound quality by using your car's sound system as a receiver. It takes less than an hour for I Fit That to mount the Parrot CK3000 EVOLUTION : electronic box, microphone, keypad. There are no apparent wires. Once installed, just turn on the engine and you are immediately connected to your phone. Even by leaving the mobile phone in his bag, with his Parrot CK3000 EVOLUTION, the driver dictates a name and is immediately connected to his correspondent. The car's speakers transmit the conversation with perfect quality of sound, regardless of the driving conditions (traffic, highway...). Make calls with the greatest of ease via voice recognition and the browser button. 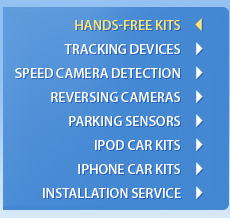 When users get in their car, they start the engine and the kit immediately connects to their mobile phone. Thanks to the voice recognition feature, drivers say a name and the kit automatically dials the number. Keep your hands on the wheel and guarantee your safety. By intuitively turning the browser button, the kit states the menu functions, meaning that drivers can check and manage their voicemail, etc. It features a discreet and extremely sober design and fits seamlessly inside the car. In the event of a call, the car radio automatically cut outs, so that the speakers can transmit the conversation, and the microphone clearly reproduces the sound of your voice. We do not use online ordering as we like to ensure that you are buying exactly what you need to avoid disappointment. Please call us now on 07983 663 7091 to purchase this or to discuss any specific requirements.